Dalton has a gift for poetic phrasing that captures the historic setting and transports the reader to President Grant’s time period. 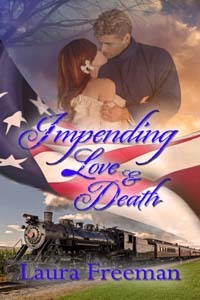 When his timid cousin Cassie Grant accidentally shares her bed with cavalry Captain Chase Brooks, they are forced to marry to avoid a scandal. A common ploy in romance novels, Dalton deepens the challenge of keeping the perfect couple apart with the backstories of Cassie and Chase. They wrestle with their own demons and struggle to resist the growing need to unite as husband and wife physically and emotionally in a natural progression. Dalton provides plenty of action, and she passes the test of historic romance by creating a story that could only take place in this time period. I only wish she had written a longer story. “The Utterly Deadly Southern Pecan Pie” by Penny Burwell Ewing is the second book in The Haunted Salon series and combines ghostly helpers with a cozy mystery to keep the reader turning the pages. Written in first person, Jolene Claiborne is the hair stylist who sees ghost and solves mysteries. She has two younger sisters who help her and parents with a history that makes Daddy the prime suspect. Detective Samuel Bradford is the love interest but at odds with her special powers and knack for finding trouble. It has a strong Southern voice and the setting backs it up with a beauty pageant, baking contest, Southern mansion, and Civil War reenactment. The modern day mystery is solved with clues from the Civil War and unfolds in a well-paced series of events that reveal just enough to keep the reader waiting for the next hint to drop. Jolene is the type of character that keeps readers coming back to find out what she’ll do next.